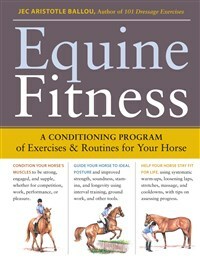 Get your horse in shape and maintain his overall fitness, regardless of his age or abilities. Equine Fitness will have your horse looking and feeling his best with a series of fun exercise routines specifically designed to enhance his strength, stamina, and agility. Clear step-by-step instructions and detailed illustrations make the exercises easy to follow, and the book includes a handy set of pocket-sized cards that you can use in the ring. Jec Ballou’s simple conditioning program promises lasting results for healthy horses and satisfied riders.